I’ve already turned the heat on a couple times, so I know it’s getting close to cold and flu season. I try to hold out as long as I can because I have noticed every year when I start the heat, we all get scratchy throats, and sometimes even catch a cold. I think the germs are trying to get in where it’s warm or something. I like to keep certain products handy just in case one of us gets sick. It’s terrible to have to go out and buy stuff once a family member is ill, so this time of year I try to stock up on certain products that make me feel more confident during cold and flu season. Even more important are the items I cannot buy locally, and have to order on line and wait for the postman to deliver. I’d rather have them on hand, and not have to wait a week or more to get the things I need when feeling ill. 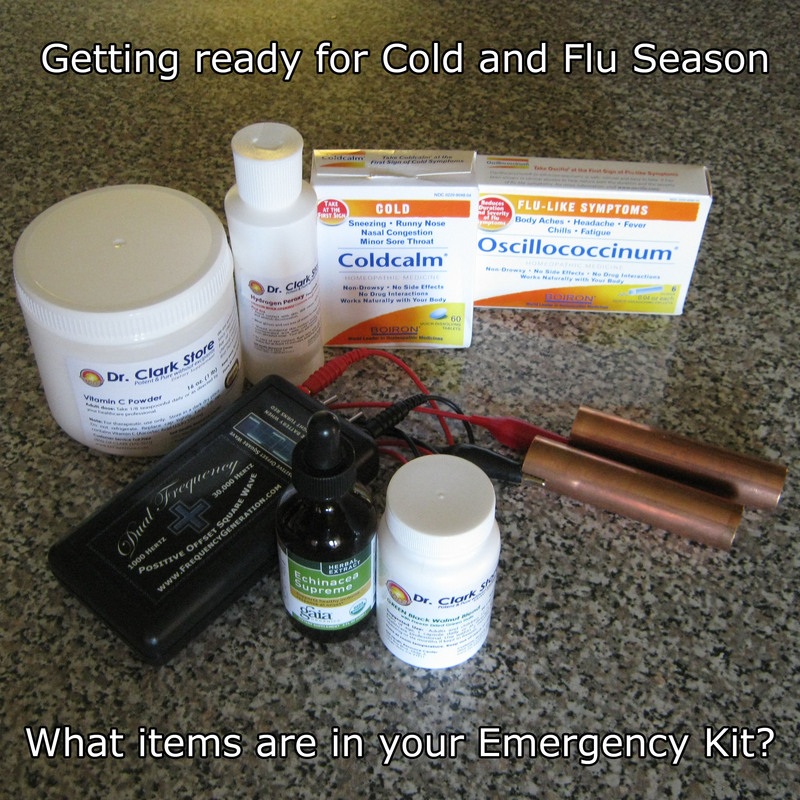 These are the items I have in my Emergency Kit: Vitamin C, Food Grade Hydrogen Peroxide, Cold Calm, Oscillo, a Hulda Clark Zapper, Echinacea, and Black Walnut Hull Capsules. Some of these items I sell at NaturalHealthSupply.com, and others I buy at local drug stores, health food stores, Amazon, or supermarkets. I love my one pound tub of Vitamin C, which is simply ascorbic acid you spoon into juice now and then. No capsules or added ingredients, just pure potent vitamin C to boost the immune system when you need it. A 16 ounce tub should last you all winter, and beyond. The Food Grade Hydrogen Peroxide has a ton of uses, but we use it for sore throats. Simply add a few drops to an inch of water in a glass, and gargle. It will foam up and you spit it out into the sink. We also dilute it with water to use it year round for cuts and scrapes. I like the non toxic nature of hydrogen peroxide. Its chemical name is H2O2, and it turns to water when it is no longer fizzy and full of oxygen. Amazing magical stuff. The company Boiron makes two homeopathic remedies for cold and flu season and I swear by them both. Cold Calm and Oscillococcinum are amazing products perfect for kids or adults, just read the instructions. They are found at Amazon, Rite Aid, Walgreens, or Safeway. I use them only at bedtime for a good night sleep if I am under the weather. If I have a head cold I take Cold Calm according to the instructions and it clears up my sinuses so I can breathe and sleep easy. If I have flu symptoms of body aches and a fever, I take Oscillo to rest easy at night. I find the more I take them, the less they work, so I use them when I need them most, and that’s usually just before bed. I use my Hulda Clark Zapper quite often. Any time I feel exposed to other people with colds, or if I feel stressed or starting to get ill, I zap. I imagine all the little germs getting electrocuted, and often zapping makes me tired. Once I’ve zapped all the germs, my body has to remove all the dead critters, and I think that makes me sleepy. If I get tired, I believe I’ve hit the target. Love my zapper. Echinacea tincture is commonly found in health food stores. It’s another good item to use to boost the immune system. Add a dropper full to a bit of water in a glass and drink it according to the instructions found on the bottle. We give this to our wee one whenever she seems a bit under the weather and it really seems to help her fast. She also likes to rest and zap. This combination usually has her springing out of bed ready for action right away. Black Walnut Hull is part of Dr. Hulda Clark’s Herbal Parasite Cleanse. The freeze dried capsules are very potent. I once saw a video interview with Dr. Clark where she states that the capsules are more potent than the BWH tincture because it is less processed. The tincture is made using ethyl alcohol, which takes away some of its potency. The Herbal Parasite Cleanse involves taking a lot of Cloves and Wormwood blend capsules, but Dr. Clark stated in the video that one could skip those and take the BWH freeze dried capsules all by them self for nearly the same effect. I take two a week, and then once a month or so I take the whole maintenance dose along with the Cloves and Wormwood. There are lots of other items out there that can boost your immune system and help keep you well during the cold winter months. Everyone has their own method of surviving cold and flu season, and I always enjoy hearing about them. These are my tried and true weapons against the cold winding winds of winter. Thanks for visiting. Remember to stay warm, and be cool. This entry was posted in Secrets of the Universe and tagged herbal parasite cleanse, hulda clark, hulda clark zapper, safeway. Bookmark the permalink.